I'm telling you, if you don't have a subscription to Every Day with Rachael Ray, you are missing out! I think it's worth buying just for the fact that every recipe has a picture, which is perfect for cooking-skill-challenged people like me. 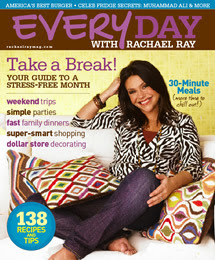 Here's what's in the March issue of Every Day with Rachael Ray (where has 2007 gone?). In my favorite feature, On Hand, we get recipes for kids that can be made by adding just five ingredients to the Every Day Kitchen, including Corn Cakes with Apples and Sausage, Chicken Pasta and Pizza Pockets. The equipment feature, Well Equipped, studies pepper mills while the Have Your Way With feature check out out four recipes for leeks. The 30-Minute Meals section of the magazine offers recipes for for St. Paddy's Corned Beef and Cabbage Stoup, Sweet Red Chowder with Leek, Corn and Crab, Beet Risotto with Roasted Asparagus and Ricotta Salata, and Turkey Saltimbocca with Honey Polenta and Kale. Rachael also shares a menu for a birthday dinner for her sister. In the No-Recipe Zone we learn to make Chicken Parmesan Subs. The Burger of the Month for March is Cordon Croquettes, which doesn't exactly look like a burger to me, except I guess the batter on the outside takes the place of a bun? In the entertaining section, Get Together, Rachael hosts a poker party and visits a Boston-area pub owner for "an authentic Irish feast" that includes Brown Bread with Smoked Salmon, Apple and Watercress Salad, Shepherd's Pie and Irish Cream Rice Pudding. Also, learn how to set a gorgeous table with items from the dollar store and learn three new twists on a Bloody Mary. From the world of travel, Go Away takes us to the great outdoors of Los Angeles, a political insider's tour of Washington, D.C. and tells us what gear we need for a trip to San Antonio. Waiting for my issue to arrive now! As you predicted, they are raising the subscription rates. The cards in this issue have a year for $19.98, and last issue was still $18.00. I'm hoping they will cut a break for subscribers when it comes time to renew. Anyway, you're right, the pictures add a lot to the recipes. Darn, I didn't want to be right about that. It's still a pretty good deal, though. Looks like good stuff! I can't wait to get mine. She looks so cute on the cover this month. My favorite feature is the pet-friendly section. Not because I like cooking for my dogs, but because it is the only magazine that gives me the option to! It's a very sassy cover this month, don't you think? I was lucky. I have a 2 year subscription for $24.00. It was on the cards in the first issue so I signed up. I love this magazine. Anony - I did the same thing, but at the time we didn't know if the magazine would be a hit, so we are lucky!